YOU'RE YOUNG. YOU'RE CHANGING THE WORLD. AND YOU'VE DECIDED TO APPLY. NOW WHAT? Every year for the past 12 years, YouthActionNet has been in search of the world’s most outstanding social entrepreneurs under the age of 30. They are bright, engaging, creative, driven and endlessly enthusiastic about the change they’re making each and every day. Now, we need your help finding the next class of exceptional young leaders. Do you know someone who fits this description? Is that person you? Applicants must be 18-29 years old, proficient in English, and founders (or co-founders) of existing projects or leading a project within an organization. In addition, applicants must be able to demonstrate one year of impact and they must be available to attend a week-long, all expenses-paid leadership retreat in São Paulo, Brazil in October 2013. The deadline to apply is 11:59PM (EST) on March 17, 2013. We pride ourselves on our commitment to diversity and encourage applicants from all countries, backgrounds, and educational levels to apply. Our Class of 2012 had 20 fellows from 18 countries represented. We offer an online application as well as a Word application to encourage applicants across the internet access spectrum. 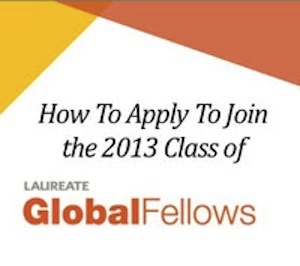 You still have 5 weeks to apply to become a 2013 Laureate Global Fellow and we hope you'll spend the time to make your application memorable. To help you craft your perfect application, we've created a short 12-minute presentation to help walk you through some common mistakes and tips for success. Watch the video now to help write your perfect fellowship application. Once you're ready, start your application.